Two years after paleontologist Jordan Mallon of the Canadian Museum of Nature and his team discovered the skull of a chasmosaur while going through a dinosaur bonebed in Alberta, he finally got to see a helicopter lift it into the air. "There's no roads down to the site, it's very remote," Mallon said Tuesday from Brooks, Alta., where the chopper was refuelling as it made its way from the spot along the South Saskatchewan River back to Calgary after completing the lift last month. Comparing it to "a rhinoceros on steroids," Mallon said this particular chasmosaur has turned out to be a particularly rare specimen with a long brow horn. The unusual looking dinosaur, which had a frill resembling a giant flap behind its head, was a plant-eater that lived about 75 million years ago. A relative of triceretops, but smaller, the chasmosaur walked on all fours and had horns. 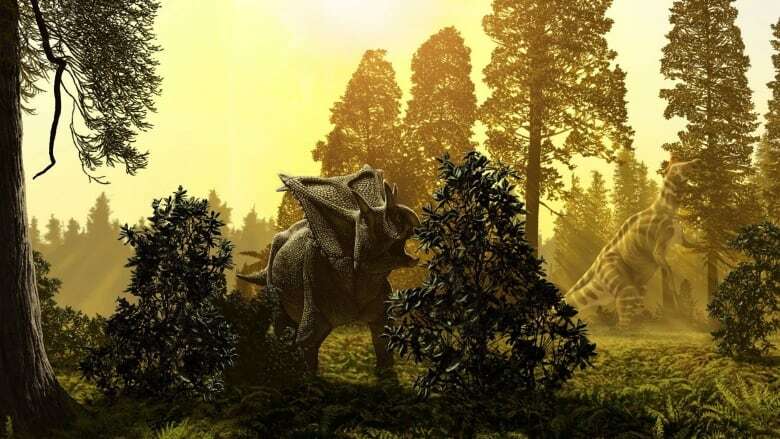 Mallon said that while other fossils of the long-brow species -- Chasmosaurus canadensis -- already exist, they were found about 100 years ago and accurate records about the locations of their discoveries aren't available. With this specimen, Mallon said they know where it came from, which will help determine the evolution of the animal. "We can place it in the fossil record and have context for how it's related to other horned dinosaurs," he explained. "We've got one of those rare long-horned types right now and that's one of the reasons we're so excited about it." 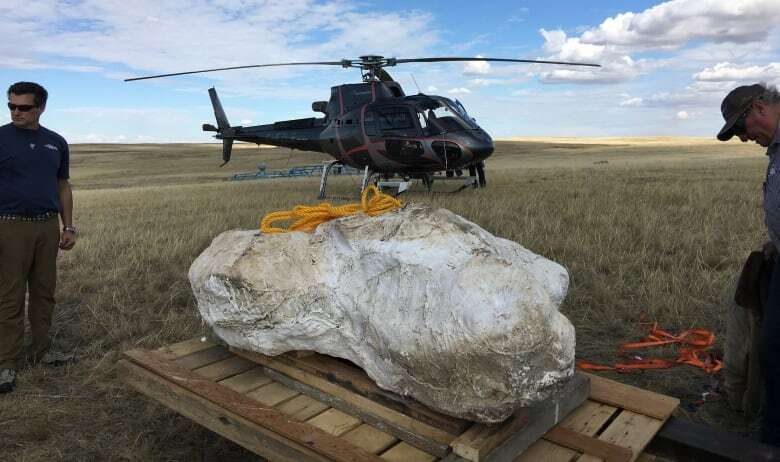 Even with the assistance of a helicopter, lifting the 2,000-pound skull that's encased in protective plaster from the hillside to a waiting truck about 500 metres away was challenging. In August 2016, the specimen was prepped and coated in a protective plaster jacket. The team returned in August of this year to prepare the skull for transport. The helicopter lift was originally supposed to happen in August but was delayed twice due to rain. Winds in the badlands start to pick up in October, and Mallon said if the skull couldn't be carried out this month, it might have had to wait until next year. Early 20th Century paleontologists who needed to move heavy, plaster-encased fossils had to rely on horse-pulled wagons or river scows to get their specimens out of rough Alberta terrain. But according to a paper by Darren Tanke at the Royal Tyrrell Museum in Drumheller, Alta., the last time anyone used horses was 1954 when the Royal Ontario Museum used them in today's Dinosaur Provincial Park. By then, work horses capable of hauling heavy goods in tough terrain were becoming fossils themselves. Tanke wrote that a the first use of a helicopter to lift fossils was September 19, 1967, when a Canadian Armed Forces twin-rotor Voyageur helicopter lifted an ornithomimid skeleton of the badlands for the University of Alberta in today's Dry Island Buffalo Jump Provincial Park. The chasmosaur skull that Mallon and his team extracted is being driven to the Royal Tyrrell Museum. Sometime this fall, it will be shipped to the Canadian Museum of Nature for preparation and study. Pieces of the frill are back in Ottawa already. "The frill looks really good so we think it's going to be a nice skull," Mallon said.